I told you all in an earlier post that I was not putting away my white jeans this fall, but in reality, I barely put away any of my white clothing at all. In thicker fabrics, winter white is more popular than ever right now & I am loving adding white knit accessories & thick white dresses & sweaters into my looks. Pieces in fabrics like denim, leather and knits are appropriate for the winter weather and look fresh & modern in a bright white shade. In today's look, I added complimentary neutral accessories, or you can try going to the opposite end of the spectrum with black accessories. We have been SO lucky thus far this month with some of the most gorgeous fall/winter weather, so I have been able to go sans tights pretty often. Instead, for a less wintery but still cozy look, I have been adding thigh high socks to my outfits. Tall socks look great peeking out of knee high boots with bare legs or layered over jeans. How do you wear winter white? Share your look below! We love the holiday party looks shared by Briana from Neutral 2 Neon & Crissy from Some Velvet Morning. such a chic look! i ADORE your boots! Thank you! Frye boots are the best - I have had mine for years! Too cute for words - Happy Holidays!! Gorgeous all white look! Love the layering. Love the white look! You look so cute! I love all of these whites mixed together. Perfect winter look!! Love the winter white! I thought your scarf was the collar of your dress at first. Very cool! The boot socks are so fun. I keep wanting to try that. It's like a cross between a scarf & a snood! I love it! Loving your winter white! Cute hat! I absolutely love this look!!! Gorgeous! This is a fantastic winter white look. I love to wear white myself in the winter. It somehow seems to brighten up my day. I like it so much better than black. You look fantastic. Thanks for sharing the linkup. I agree! There's nothing like some crisp white to brighten up a gloomy day! Wow! Love this outfit! I have a similar scarf, but in grey. I never thought of pulling it over the shoulders like that. I will have to try it! Yes - this type of scarf makes a nice faux collar over a simple dress! Beautiful winter white look!! So pretty! This dress is too cute! I love the pockets! Love the different layers of white! Thank you for hosting and hope you are having a fab week! Such a fun look! I love that white dress, it looks so comfy! It is! It's super thick cotton so it's soft & warm which is perfect for this weather! I love wearing winter white! It's so sophisticated yet has a cozy feel. Loving this look, and your white paired with the brown boots and bag! Me too - I went totally neutral with this look, but white pairs nicely with any color! Oooh, I just love a classic all white winter outfit! It always feels so fresh! Pretty! I love winter white outfits- this is super cute! Perfect way to wear all white, I love the layering. 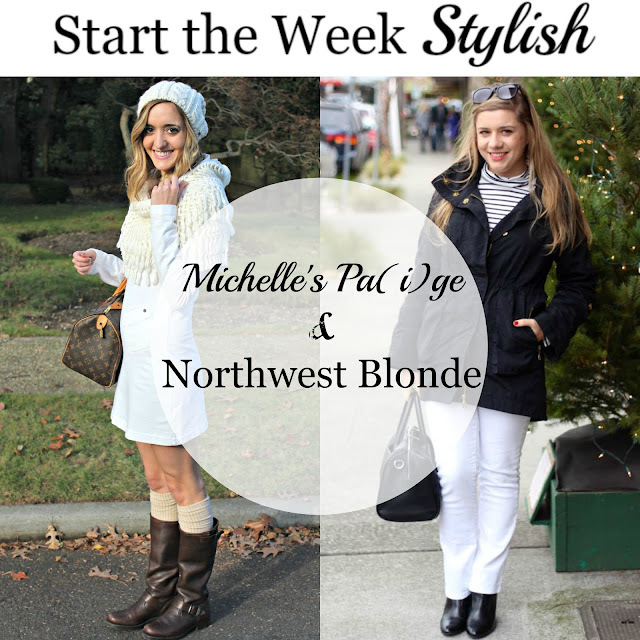 This is a lovely winter white look, Michelle! You look gorgeous! Such an angelic look! Love the scarf! Michelle, what a cozy and chic look! I love this and the details of your scarf are so cute and festive! Thank you for sharing and have a wonderful week ahead! Thank you so much for stopping by! So glad to hear you like this look! Beautiful cosy winter white look ! Cute look! I love the socks with boots look especially since it is not that cold in North Carolina! Same! We have been so lucky in NY with some nice weather! Love all of the different shades of white together! I wear white all year...fashion rules are just silliness. I agree - this shade is too good to not wear all 4 seasons! You are wearing winter white so well. I love that you wore so many winter white pieces together and also chose some sturdy brown leather to accessorize with. The dress is so cute. I love the asymmetric pocket.